The past two weeks have been dedicated to my “it’s not about the cookie” framework, which shows how the experience and all the things leading up to the sale matter much more than whatever is being sold itself. This week, I am extending this framework to one more application – change management. Think of this as any time you are trying to get someone to buy in and make a commitment where money is not exchanged. In this behavioral economics podcast, I talk about what change management actually means and how the “it’s not about the cookie” framework ties into change management. I talk about how using perceived ownership, the endowment effect, and loss aversion to your advantage in the beginning will pay off in the end. I also talk about how framing is not what you say but how you say it and how to overcome status quo bias. 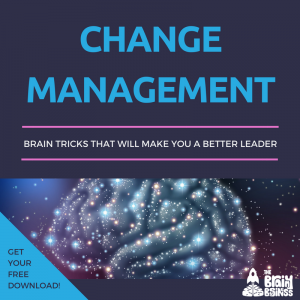 This is the most complex episode of the cookie framework, but it will give you proven tools to implement change. [03:38] What the concept of change management actually means. [04:59] Change management or leading through change is something that a lot of people are talking about these days. [05:18] Change and getting people to change is all about selling them on your perspective and getting them to buy in and commit. [05:48] An example of trying to get your significant other or child to do something. [07:48] Ways to get the child to buy in may be making it fun, leading by example, and using distraction. [08:32] I often compare our subconscious brain to a small child. Much of our decision-making is still that on this level. [09:22] A small detail can hang people up when making positive changes. [10:30] How what the person selling the concept thinks is important may not align with what the person buying the concept may think is important. [10:52] Consider the ripples. One small word can have a different impact on different people. [11:21] An example from my credit union days. [12:51] When it comes to credit cards there will be several different groups affected. The messaging needs to be focused for the individual groups that matter. Keep the overall brand message consistent. [14:36] I’m not getting into habitual buying in this episode, but it is really fascinating and I will dedicate an episode to it soon. [15:17] It’s important to think about what the specific people need to hear and where they are coming from before applying your messaging. [15:34] Thinking about the group as a whole instead of considering the individuals. [15:55] Office Space, Milton and the red stapler. [17:19] How our brains are very good at dwelling on small items. [18:21] The endowment effect as the anomaly that our brains favor things they own over other things. [20:10] We go all in with things that we already have. [20:24] Loss aversion. People hate to lose things. It takes double the joy of a gain to outweigh the pain of a loss. [22:35] Status quo bias. When given the choice people tend to go with the status quo and favor it heavily. Be wary of giving people too many choices. [23:13] How all of this ties into change management. Using these concepts to your advantage is the best approach. [23:45] The five components of “it’s not about the cookie.” The scent of the cookie, free sample, perceived ownership, today only, and buy three get one free. [24:26] The prep is critical for change management. [24:46] How the smell of the cookies breaks through your subconscious clutter. [26:33] How rumors about the upcoming change are like the smell of burnt popcorn. [28:04] Be thoughtful of how the meeting is framed. Avoid being too vague. [29:14] People need time to process. Share and be transparent. [29:32] Reciprocity – sharing information makes the recipient more likely to have an open conversation. [30:43] Perceived ownership is where people work harder for ideas that they came to on their own. Outline the information you present, so that the recipient will perceive ownership. [31:12] Do your homework when proposing a big change. [34:07] The importance of having advocates and thinking long-term when any change is implemented. [35:10] Using scarcity is optional in change management conversations. Use with caution. [36:45] Knowing what matters to each person helps facilitate the conversation with the desk moving example. [38:28] The problem with unintended ripples using the scarcity approach. [39:10] Framing is everything when it comes to change management. It’s not what you say it’s how you say it. [40:03] Decide what the one thing is that you want this person to do. Get the person invested in the outcome. [40:37] Frame your offer properly by pointing out the benefits. [44:07] If you thought this was the most complex of the scenarios in the “it’s not about the cookie” scenario, you’re right. There is a reason it was the final installment. [46:11] Change is all around us, and being able to lead people through it is important in any business. Turning naysayers into advocates is critical to your success. [47:28] Don’t forget to tune in next week to Episode 8 What is Value? This episode will make it clear why the cookie framework is effective. Episode 3 Do Lead Magnets Work and Do You Need One?